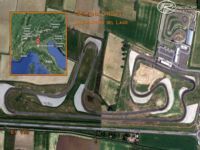 After Le Colline, built this new track in preparation to a Formula Predator's PC010 test. Pretty basic as usual but gets the job done if you want to learn the track. Used Google Maps to lay-out the track and to texture the terrain. Put the extracted SanMartinodelLago folder in your rf\Gamedata\Locations folder. Make sure you have a sky.mas file in your rf\Gamedata\Locations folder. There are currently no setups for San Martino del Lago aka Cremona Circuit. Add a Setup. I got part one, but when I tried to unpack the zip in the 7zip file I was informed the zip was empty by .rar. @vis: what "sky.mas"? I have no sky.mas in my location folder. I did not need one for years of happily using rFactor. Where do I get this sky.mas ? are you sure you really want to download it? Yes, i have the same problem.Link is not working.